Dr APJ Kalam’s scientific, intellectual, academic, and philosophic bent of mind is evident not just from his headline, but also from his slim, knotted, waisted fingers, long, slim first phalanges and the developed upper Moon mount. In combination, these signs show that Dr Kalam to have the personality of an intellectual, and a person with an investigative mindset, superior analytical ability, and great organization of thought. if one had to encapsulate Dr Kalam's personality in a few words, it would be idealistic and principled to a fault. Check out a photo of his hand here. 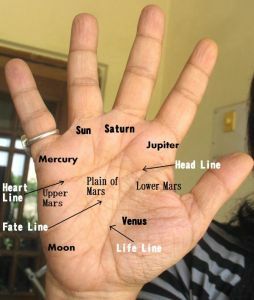 The tapering fingers of Jupiter, the developed Jupiter mount, as well as other straight, conic shaped fingers and long first phalanges tell us this. In addition, he has a developed Upper Mars mount, and an underdeveloped (relatively speaking) lower Mars. This shows a mentally strong person, a person who will not bend to anyone's will; someone who can hold his ground. In addition to idealism, he is a person prone to impressionability and could get carried away by great and noble ideas. He is something of a dreamer, a person who wants a world to be “ideal,” but he is not weak by any means. In fact, his thumb, though impressionable, shows him to be very strong-willed. His hand and thumb show a complete lack of materialism, a deep generosity and compassion for the underprivileged. People like Dr Kalam are not easy to get along with because they tend to stick to abstract principles come hell or high water. Nothing can move them, certainly not the lure of the lucre. In addition, Dr Kalam’s strong Upper Mars mount, thumb and deeply etched Headline shows him to be strong-headed, willful and quite determined. The more people try and persuade him, the more likely is he to stick to his guns! After seeing his hand I quite believe that he was ready to appoint Sonia Gandhi as the Prime Minister in 2004 (however much he hated the idea) if she had staked a claim because as he has said he would not do anything to destroy the sanctity of the constitution. If Dr Kalam did not reveal this important fact at a time when there was a strong rumour that he had actually stopped Sonia from becoming P.M. the explanation lies in his hands. Dr Kalam's hands show him to be a very secretive, closed, shrewd and even a manipulative person! This is evident in the way he holds his thumb and also in the shape of his Jupiter and Mercury fingers. In addition, is also a deep planner and thinker, he quite likely had sound reasons for the secrecy. We may or may not believe that Sonia Gandhi wanted to be P.M (she proposed Dr Manmohan Singh’s name when it came to the crunch), and Dr Kalam said he was surprised at this turn of events because he had expected that she would stake the claim herself. I have my doubts about this. Dr Kalam is the kind of person who would be opposed to Sonia becoming the P.M as strongly as he would be opposed to fiddling around with the Indian Constitution, and therefore being extremely shrewd, it is almost certain that he would have hinted (either to her directly or through one of her cronies) that he could possibly reject her candidature. Dr Kalam’s hands show him to be quite strong-headed, not the kind of person anyone can bend. Or check out the hand readings of the Heads of States from different parts of the world. can u do mohammad ali and sylvester stallone hand please? Samir, I shall look out for their hand pictures. DI, looking at his hand is certainly aspiring. It is not just his intellect, but his ideas that are so inspiring. I think he is the only person in politics who is as good as any of the founding fathers of this nation. Sonia Gandhi I am sure is afraid of him. Can you read my hand? !